To save her ill son, a widowed field mouse must seek the aid of a colony of very strange rats, to whom she has a deeper link to than she ever suspected. Along the way, she (and the audience) learn The Secret of NIMH. 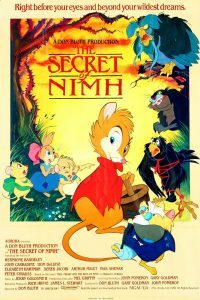 I have to say, I’m terribly torn writing this review of The Secret of NIMH. On the one hand, the animation is absolutely gorgeous. It’s a joy to watch. And, the voice acting is wonderful. I could imagine young children having nightmares after the scene with the Great Owl (voiced by John Carradine ). Dom DeLuise shines as the comedy relief crow. Elizabeth Hartman is wonderful as the loving momma mouse – who’s forced to become the heroine to save her family. And that leads to the negative half. I’d read the original book before seeing the movie. And it’s a wonderful story, that doesn’t fit into the cookie-cutter mold of the typical Disneyesque kids movie. So, the story gets thrown out the window so that we can have a villain (very nicely voiced by Paul Shenar), betraying the leader (Derek Jacobi), and in a final duel with the hero-to-be (Peter Strauss). Everyone does a fine job … but it’s the standard, stereotypical, cliched story that we’ve seen a thousand times before. Gorgeous, well-acted … but we’ve seen it all before. And, it’s a crying shame. I’d love to see someone do a remake, that’s actually faithful to the original story.